PUBG Mobile is quite easily one of the most popular games out there right now, and it’s popularity has reached peak levels in recent times. So, it’s only obvious that Tencent games wants to capitalise on the game’s wide-ranging fan base with things like the Elite Royale Pass, crates and items that can be purchased with in-game currencies and more. Now, the company has added yet another way to make money off of PUBG Mobile, and this time it’s in the form of subscriptions — PUBG Mobile Prime, and PUBG Mobile Prime Plus. Both the subscriptions offer players benefits of varying degrees, offering daily UC (the in-game currency in PUBG Mobile), Royale Pass points, and a lot more, for a monthly recurring fees. In this pack, which is the more affordable of the two, players get the option to purchase items using BP instead of UC. However, these items will not be permanent and will be either 7 day items, or 30 day items. Purchasing items permanently will still require UC (which can be purchased in-game). Other than that, players will also receive 5UC every day, which adds up to 150UC in a month. 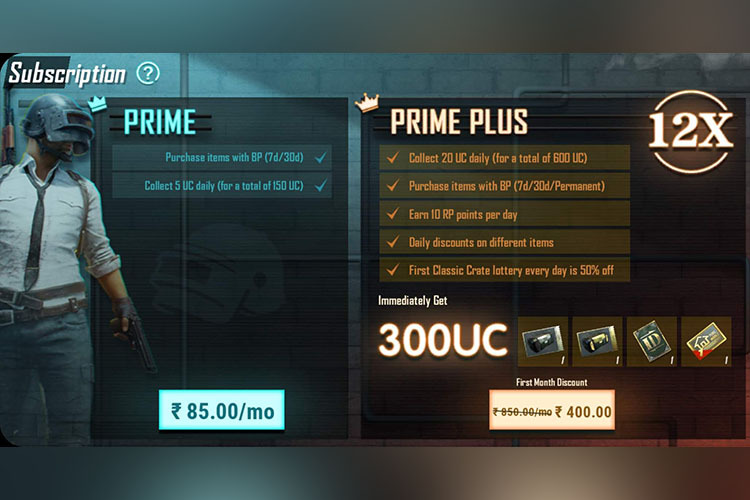 The PUBG Mobile Prime Pack is priced at Rs. 85 per month, and it might be a solid proposition for players, since buying 150UC in the game itself would cost well over Rs. 85 in itself. Players will be able to purchase items with BP instead of UC, and they’ll also be able to purchase permanent items with BP — something that regular PUBG Mobile Prime subscribers will not be able to do. Players will also get 20UC every day, which adds up to 600UC in a month. Subscribers will also be getting 10RP points every day, along with daily discounts on different items. Moreover, if you buy this pack, you’ll immediately get 300UC, a classic crate coupon, a premium crate coupon, a rename card, and an advanced room creation card. The PUBG Mobile Premium Plus pack is priced at Rs. 850 per month, but you can get it right now for just Rs. 400 for the first month. At either of those prices, this pack more than justifies the things it bundles, so if you’re someone who likes to spend a lot of UC in the game, you should maybe consider getting this subscription. With the new subscriptions, PUBG Mobile and Tencent games are obviously going to make a lot of money. Still, the packs do have a value proposition to them, at least for people who buy the Elite Royale Pass, and like to open a lot of crates to get cool stuff out of them. It’s all about the micro-transactions at the end of the day, and Tencent is definitely looking to get all of the money it can out of the game.